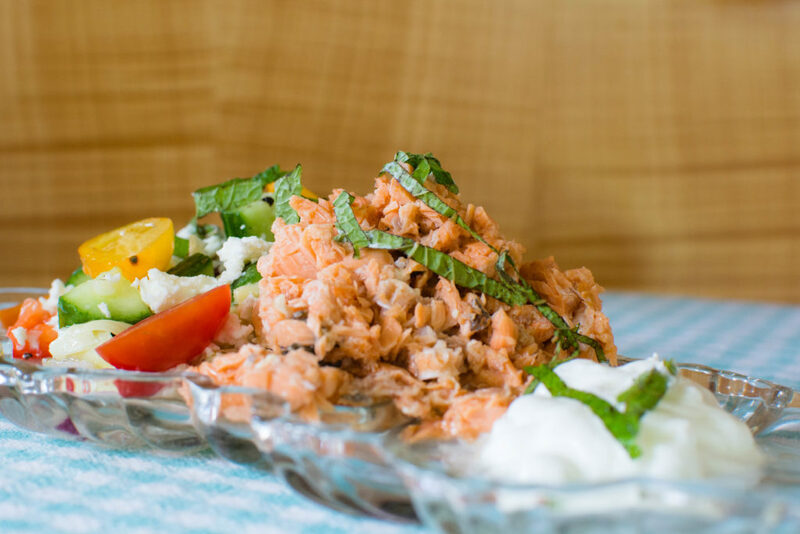 This traditional "Greek Salad" is served alongside drained and flaked canned salmon and Greek yogurt for a nice meal packed full of super foods. We suggest making the salad ahead of time and keeping a 'pop-top' can in the refrigerator next to it for an easy lunch at work or wherever you need it. The ingredients are easy to find and and prepare and will keep you filled with energy for a long time. Whisk together Lemon Juice, Red Wine Vinegar, Olive Oil, Garlic Paste, Dried Oregano, Salt and Pepper in a bowl. Add the diced vegetables and feta cheese and refrigerate until ready to eat. Serve salad alongside 3.75 oz. of salmon with a spoonful of Greek yogurt and fresh mint.